Ever since the iPad was introduced two years ago, its potential to revolutionize the restaurant industry has been widely touted, with some restaurants already moving to replace their traditional point-of-sale devices with iPads and companies such as Square seeking to fill that need. And while iPads in restaurants have been catching on here and there, the concept could be ripe for major expansion if a pilot program from restaurant chain Buffalo Wild Wings proves worthwhile. As detailed by Computerworld, Buffalo Wild Wings is expanding an initial pilot program at one of its Toronto area locations to a new location in Minneapolis, stocking each table with an iPad to allow customers to place their own orders and browse the Internet. "Ultimately, we are trying to use the technology to enhance the customer experience," [Buffalo Wild Wings director of international business Tim Murphy] said in an interview. "People are familiar with iPads, iPhones and Android tablets, so this would enhance that." The iPad project has seen Buffalo Wild Wings partner with HubWorks Interactive, which offers several different mobile ordering platforms for the iPad along with a case that offers security and protection, a kickstand, a credit card reader, and extended power capabilities including AC power or up to 16 hours of battery life. The company sells basic iPad packages for $750 apiece. Rather than bolting or tethering the iPads to the tables, Buffalo Wild Wings has opted to equip each device with an RFID chip to serve as a deterrent to theft. The report notes that social restaurants such as Buffalo Wild Wings are ideal environments for the iPad, with the restaurants typically catering to larger crowds where at least some members have an interest in staying for extended periods of time and watching sports on the numerous televisions mounted around the dining areas. In the first test, while men in a group typically watched a football or hockey game, women in the group would pick up the iPad and launch Facebook, Murphy said. "We have a very captive audience with good sales volume in our restaurants, so we view this iPad as a way for customers to stay connected socially and not have to use their own device." 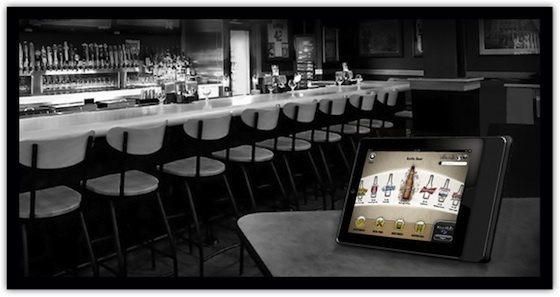 Buffalo Wild Wings continues to explore all options for the iPad in its restaurants, considering integration of mobile advertising to help offset costs and discussing the possibility of using camera-equipped iPad models to allow video chatting at tables. I can't wait to touch other peoples' wing sauce and saliva from their fingers. I can't think of a worse restaurant for this. There's a walk-up cafe (walk up, order, pick up food, sit where you want) near me that gives the option to order by iPad at the entrance. No way - I'm not touching that thing after everyone else has. I'll order from the human behind the cash register, thank you very much. And then take the cash they hand you that's just as dirty as the iPad (or dirtier - I bet that iPad gets wiped clean every once in a while, when was the last time you cleaned the cash in your wallet)? As great as the ipad is, I'd much rather interact with a hot waitress when ordering food. OMG -- can you imagine the gunk, food and greasy fingerprints that these things have on them at the end of the day?! I believe there are even those that would deliberately try to break the device (pour soup into the head phone jack, etc) -- there are some ridiculous people out there that just want to destroy stuff. Aww, I posted a whole reply and then got a 503 "guru meditation" error that wiped my post. Anyway, basically I wouldn't want to replace human interactions with waiters/waitresses. Though I could see this technology being used at fast food or takeout type places. Imagine walking up to a kiosk, ordering your custom burgers or pizzas, getting a ticket number printed, then just waiting for your number to be called. But for sit-down places? No, I like talking to service staff. Oh boy, I can't wait use a locked down iPad coated in old honey mustard and crusty barbecue scunge. Do you touch door handles to get inside buildings? Germophobes are funny. Sad, but funny.